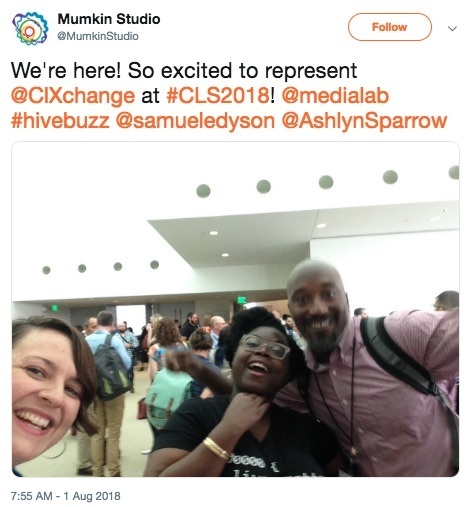 This summer, the Chicago Learning Exchange (CLX) proudly sponsored the first annual Connected Learning Summit (Summit) hosted at the MIT Media Lab. The three-day conference brought together more than 700 educators, innovators, researchers, and technologists, including dozens of attendees and presenters from among the CLX community. The mission of the Connected Learning Summit is to fuel a growing movement of innovators harnessing emerging technology to expand access to participatory, playful, and creative learning. Like the Chicago Learning Exchange, the Summit unites work that has been active for nearly a decade. The Summit is a merger between the Digital Media and Learning Conference, the Games+Learning+Society Conference, and Sandbox Summit. With a unique focus on cross-sector connections and progressive and catalytic innovation, the Summit will become an annual convening of leading researchers, educators, and developers alternating locations each year between MIT and UC Irvine. The Chicago Learning Exchange Community played a prominent role at the Summit! Not only were Akili Lee, VP of Product Management at ThinkCERCA, and CLX Deputy Director Sam Dyson members of the Summit’s Organizing Committee but thanks, in part, to support from CLX, several members were able to participate as attendees and presenters. One of the benefits of CLX membership is the opportunity to apply for travel stipends to attend select conferences. Over the years, we have supported nearly 100 members to attend conferences like the previous Digital Media and Learning Conferences, the Mozilla Festival in London, the Allied Media Conference in Detroit, and now the Connected Learning Summit. Q: How did the conference support your professional growth or practice? A: The conference supported my growth in several ways. First, it connected me with real takeaways that I could immediately bring back to implement into my programs, such as new ways of utilizing Minecraft or collecting embedded assessment from maker-activities. It also gave me a larger picture view of how connected learning is being used in the present and how it continues to be developed across the world in OST programs like my organization; but also in schools and libraries, and how academics are intricately involved in the process. Q: What aspects of the experience did you find most meaningful and why? In addition to all the ways that the conference has assisted in my professional growth (which really hits at the root of this question), I would also like to highlight how impactful the morning keynote with Baratunde Thurston and Joi Ito and the plenary with Michelle King were. The organizers did a great job in selecting individuals that were both highly engaging and had extremely relevant insights to share from their own personal experiences. Just being present with and connecting with so many other individuals who are involved in this work in different ways was quite meaningful. Want to be part of future events like this? Join us by visiting chicagolx.org/joinus!